Cyclists, promoters, fans, team management and anybody else with a passing interest in cycling will be fully aware that the 100th Tour de France is nearing completion. Some avid social media users may also have noticed a petition to Christian Prudhomme (the race director) and the ASO (the race organisers) asking for the organisation to stage a women’s version of the race. Let’s have a look at the issues surrounding it. Women’s professional road cycling has (for an eternity) been the poor cousin of the men’s equivalent. Where other sports (triathlon, athletics, swimming, volleyball etc.) have managed to equalise pay and performance standards at the top level, cycling hasn’t. The biggest problem by a mile is the sport’s governing body, the UCI. The UCI’s own rules enshrine this inequality. For instance, the UCI’s own technical regulations have maximum distances for races. This is understandable. A 17 year old kid’s race would be ridiculous at 200km. Similarly the UCI’s regulations limit the length for professional men and professional women too. 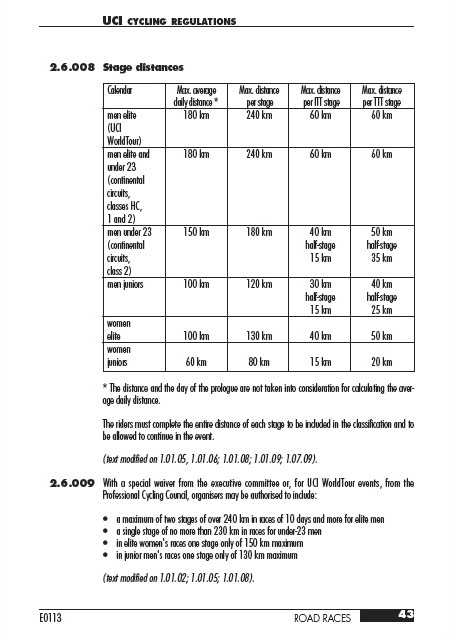 However, the UCI’s bias toward female athletes comes to the fore here when women’s races are limited at 130km compared to the men’s limit of 240km which can (per the rules) be extended! 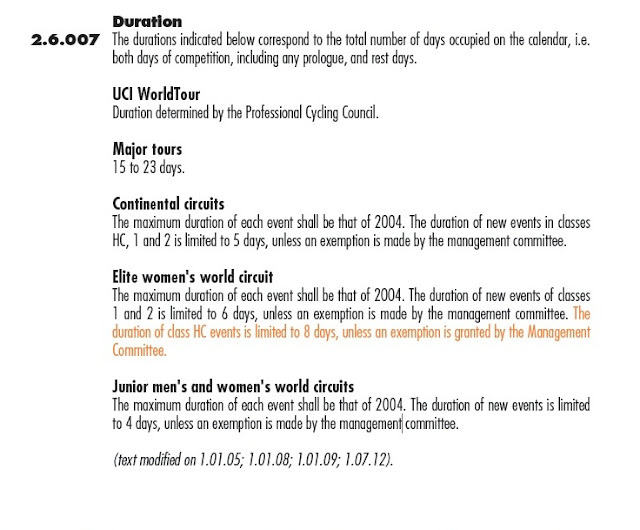 Further to this, the UCI also enshrines in their rules a duration limit for cycle races. Again this is fair enough; a two month race would be downright dangerous as well as unfeasible. Yet the UCI has mandated that a men’s race can be up to 23 days but in the elite women’s circuit regulations it is stated “The duration of new events of classes 1 and 2 is limited to 6 days, unless an exemption is made by the management committee. The duration of class HC events is limited to 8 days, unless an exemption is granted by the Management Committee.” Effectively the UCI prevents women from having the sort of epic bicycle races that generate the interest in the media and general population. Further, the UCI mandates that professional cyclists on Pro Tour (and I believe) Pro Continental teams receive a minimum wage as a starting point. This sort of protection doesn’t extend to registered UCI Women’s teams. Attitudes of the UCI are unlikely to change either. Both the current president Pat McQuaid and his contender Brian Cookson have in the past claimed that female cyclists don’t deserve this minimum wage. Amazingly with an UCI election around the corner, both now support this but you’ll have to forgive my cynicism. Pat McQuaid has been the UCI president since 2006 and in that period the number of women’s races has plummeted. He has led an organisation that has neglected the women’s sport. One can only assume that his refusal to do anything about race distances and other issues means that he feels female athletes are inferior. Brian Cookson’s CV in this area may be slightly better but I’m still not convinced. He’s been boss of British Cycling over a period of time in which the hugely successful Team Sky was founded and both men and women found significant success on the track. Yet, at the same time, the women’s road product has been neglected. The nearest thing to a “Women’s Team Sky” as it has been dubbed is Wiggle-Honda which is owned and run by Australian rider Rochelle Gilmore. The British Cycling attitude to women’s road is best exemplified by the fact that no British women are entered in the Under 23 European Championships currently underway. If Cookson is president of this august organisation, surely his attitudes must be questioned. Apart from the minimum wage issue, the opportunities for women to ply their trade fully in the sport are hampered by the pathetic prize money on offer. The Giro Rosa (the current name for the women’s Giro d’Italia) ran through the first week of this year’s Tour de France. As the only women’s grand tour allowed (per the UCI’s own regulations) it is the biggest women’s road race of them all. So you’d expect that the winner, American Mara Abbott would have claimed a pretty good prize for her win over the 8 stages, 803km and 120 odd other riders. The reality is she won a grand total of €460. To put it in perspective, the winner of this year’s Tour de France will take home about 1000 times that! To make it as a professional female cyclist is pretty much impossible. Many of the world’s best can’t dedicate themselves to their sport fully as they just can not earn enough money to live off. Yet, when they get together, the women’s peloton is just as good as the men. The UCI and others always claim that the women aren’t as professional or as capable, that they couldn’t do the distances competitively or that the interest isn’t there. How can you claim the latter if the opportunities to promote the sport on the biggest stage aren’t there? It’s against this background that a petition has been launched to give women’s cycling a massive kick into the public consciousness with an ambitious all or nothing push. The petition was started by four time Ironman World Champion Chrissie Wellington (@chrissiesmiles) St Kitts & Nevis professional cyclist Kathryn Bertine (@kathrynbertine), Dutch multiple world, national and Olympic champion on road, track and cyclo-cross (and the greatest cyclist of all time) Marianne Vos (@marianne_vos) and British Olympian and former world Time Trial Champion Emma Pooley (@pooleyemma). It seems a simple request but all involved will admit there is some massive complexity to it. after a century, it is about time women are allowed to race the Tour de France, too. While many women's sports face battles of inequity, road cycling remains one of the worst offenders: fewer race opportunities, no televised coverage, shorter distances, and therefore salary and prize money inequity. We seek not to race against the men, but to have our own professional field running in conjunction with the men's event, at the same time, over the same distances, on the same days, with modifications in start/finish times so neither gender's race interferes with the other. The women's road race at the London Olympics was a showcase for how impressive, exciting, and entertaining women's cycling can be. The Tour of Flanders and Flèche Wallonne hold similar top ranked men's and women's races on the same day, with great success. Having a women's pro field at the Tour de France will also create an equal opportunity to debunk the myths of physical "limitations" placed upon female athletes. In the late 1960s people assumed that women couldn't run the marathon. 30 years on we can look back and see how erroneous this was. Hopefully 30 years from now, we will see 2014 as the year that opened people's eyes to true equality in the sport of cycling. If you'd like to see more women's road racing on television and from the roadside, please sign this petition to call for road cycling to take a major step in the right direction. Help us break down the barriers that unjustly keep female athletes from the same opportunities as men. -- Women should have the opportunity to compete at the same cycling events as men. -- Women should be on the starting line of the 101st Tour de France in 2014. The petitioners are proposing that an exact replica of the Tour de France be run earlier in the day. When I say exact replica, I mean a 100% facsimile. We’re talking the same distances, the same climbs, the same sprint points, 9 rider teams, and the same prize money. Ideally the women’s race would have equal television too. Willingness of Pro Tour teams to cooperate to benefit the other side of the sport. The UCI could change its rules to equate maximum distance for men and women’s races very easily. This is no real limitation and in a modern environment, these regulations should no longer exist. A proper business case to the sponsors of the Tour should be able to justify an increase in their sponsorship budget. LCL, Carrefour, Skoda would all gain a significant increase in their exposure with a second set of jersey’s beaming their way around the world! Many of the major climbs are closed for days throughout the tour. Other roads that utilise rolling closures may be more difficult but this comes down to demonstrating to the authorities the benefits they get from the second race. Many of the pro tour teams already have affiliated women’s teams (Lotto-Belisol, Argos-Shimano, Belkin (the former Rabobank), Team Sky (indirectly with Wiggle Honda), Orica Green-Edge). If anything, this would be a boon for the team’s sponsors to be able to experience both elements of their team at the same time at the biggest event of the year. The old excuse about a lack of female cycling fans gets dragged out all the time yet there is absolutely no evidence of this. The crowds for the Giro Rosa were huge. The Olympic Road Race had massive crowds on television and in person (despite the weather). The simple fact is there is just not the opportunity to experience women’s cycling hence this daft notion that there is no interest. Hotel accommodation might be in short supply, possibly. Worst case scenario, use motor homes. Jayco is already a major supporter of professional cycling; this could be an opportunity for a company like that to further expand its business with a race sponsorship. The inability of women to complete the distance is another hoary old chestnut that negative cynics like to bring up. Just as a woman doesn’t compete against a man in a marathon, neither would they in this situation. It’s simply a matter of equalising the rules to allow the women to race the distance against each other. Should you have stragglers that look like affecting the men’s race, simply remove them from the race. Give the removed athlete the nominated maximum time that would just prevent their cut-off or exclude them from the race. If we can run sweep vehicles in domestic races, you can run them in international events. Truth be told, the realistic expectation is that nothing will change. I believe this petition is mostly about utilising the popularity and notoriety of the Tour to publicise women’s cycling. The requests are doable but are unrealistic by the stated 2014 deadline. It this petition is to be successful, it’s going to take longer to achieve the desired aims. As a sort of mid-way point from the petition’s ultimatums, various suggestions have been presented. Both of these are far more realistic options than the original petition and have merit but aren't my preferred option. I’m happy to admit to being initially hesitant to support this petition. Apart from my reservations about change.org I thought the proposal was a bit ridiculous and way too optimistic to become a reality. I’m the biggest women’s cycling fan (ok, maybe not, that’s Sarah Connolly’s job) but to me, it just seemed unlikely. I actually spent some time thinking about it before I was happy to sign the petition but I realised that the potential to at least expose some of the issues plaguing women’s cycling was more important than the crushing disappointment that was likely. Is a combined Women’s Tour de France possible? It is absolutely. Is a combined Women’s Tour de France likely? Definitely not. I hate to be so negative but I really don’t think the motivation is there from the UCI and ASO to make it happen no matter the ground swell of support the petition has received to date (nearing 75,000 signatures at the time of writing). A Women’s Tour de France would be a great spectacle. It could run without too many issues easily before the men’s race. To have the women race the same stages would be fair recognition of their talents and abilities. I believe it would continue to grow in popularity and any (perceived) lessened talent in the women’s peloton would instantly be corrected by the huge audience and rewards that instantly become available. But alas, I can’t see it happening. The UCI as I’ve already detailed do not want to help the female side of the sport. This is common across all parts of the sport. Aside from the race distances, the UCI allows organisers to pay pathetic prize money. 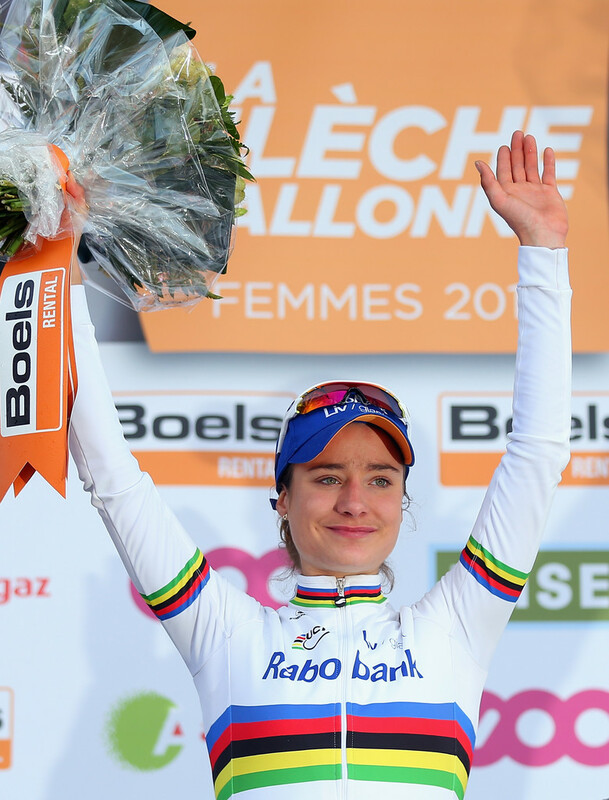 The ASO organises one women’s race, the women’s La Fleche Wallonne which pays 7% (€1128) of the men’s prize (€16,000). I can’t see them doing anything to support female participation in their showpiece. So, if this petition fails as seems likely, what options exist? I fully support the idea of the women’s scene containing three grand tours. I don’t mean 10 days and a piddling maximum of 135km each stage. I mean a full blown three week, three and half thousand kilometre epic. Where though if le Tour is off limits? The Giro Rosa has momentum and history. I’d like to see its dates change to sometime where it doesn’t conflict with a major men’s event. Aside from the Giro, I think big events could be successfully staged in the USA and Australia. Both of these latter two nations are huge sources of professional cyclists and have the varying terrain and the sporting culture to generate interest and host a successful race. I would love to see this petition succeed. I’d love to see women’s cycling appear on the world’s biggest stage. I’m just cynical about the chances. You can help our dream come true by signing the petition and sharing it amongst your friends. Twenty something amateur triathlete and Flight Instructor.